The Announcement You’ve Been Waiting On: Warmed And Bound! 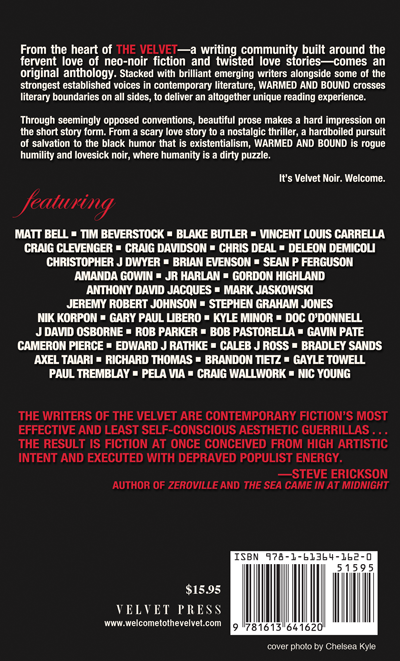 Ladies and gentlemen, it is my extreme honor and pleasure to announce to you that Warmed And Bound: A Velvet Anthology, edited by the lovely and talented Pela Via will be released on Friday, July 22nd. Ordering information will be coming soon, however the price of the print-version of the book will be $15.95. There will also be multiple e-versions available at a significantly lower price. Again, ordering information will be available soon. For additional information on this book, you can continue following me here at SeanPFerguson.com, or you can go to WarmedAndBound.com, or follow the book’s Facebook and Twitter pages. To enlarge the pictures of the front and back covers, you can click on them. They’re gorgeous, and watching them evolve over time has been more exciting. This entire process, from the beginning of an idea, to the execution of that idea, the submission process, seeing those submissions roll in, the editing process – a process I can proudly say that I was a part of – and the post-production nightmare that was trying to create a physical book that you can hold in your hand; all of this has been a dream come true. It is my hope that everyone that gets a copy of Warmed And Bound enjoys it just a fraction of how great it was to see this come to fruition. Being published alongside names like Craig Clevenger, Stephen Graham Jones, Vincent Louis Carrella, Brian Evenson, Paul Tremblay, and Craig Davidson, friends like Chris Deal, Gordon Highland, Christopher Dwyer, JR Harlan, Amanda Gowin, Nik Korpon, Gary Paul Libero, Bob Pastorella, Gavin Pate, Edward J. Rathke, Caleb J. Ross, Axel Taiari, Richard Thomas, Brandon Tietz, and of course Craig Wallwork, and all of the rest is a dream come true. They all have websites, Facebook pages, Twitter accounts, or some sort of place to communicate with them. If you enjoy their stories, please seek them out. Talk to these people about their stories, find and read their other work. This is a collection of not just great stories, but great people that aren’t getting enough exposure. And when you’re done reading, pass Warmed And Bound along to a friend, spread the word. And stay warmed. Stay bound.